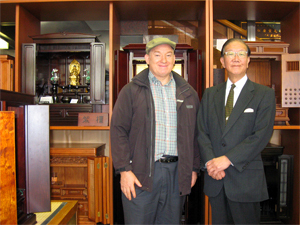 Thayne-san, today we’ll be visiting a shop in Ginza called Yasuda Shokeido which sells family Buddhist altars. It was founded in the fourth year of the Kansei Period (1792), and the first generation owner was from Omi (present-day Saga Prefecture). Apparently the Tokugawa Shogunate asked them to come to Nihonbashi in Edo. Well, let’s go in. The shop front in Ginza 7-chome, nearby Shimbashi Theater. Thayne-san, welcome! I’m Yasuda Shokei. Hi, Yasuda-san, I’m Thayne. Thanks for having us. You have the same name as your shop, don’t you? That’s right. 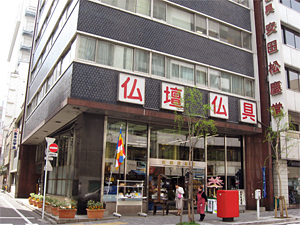 Our first generation followed the famous sculptor Unkei in the Kamakura Period, and, borrowing the second Chinese character of his name, our shop was called Genkei until the third generation. Starting with the fourth generation, we took the name Shokei, and I’m the seventh generation. I was surprised to find out the shop was so close to Shimbashi Theater. It’s been about 40 years since we moved here from Nihonbashi. At the time, this area was the booming red-light district of Shimbashi, full of geisha houses and first-class restaurants (ryotei). That’s the kind of environment we, a Buddhist altar shop, moved into, and apparently the geisha of Shimbashi gossiped amongst themselves that we would go under for lack of business. I think we’re doing quite well though, no? Certainly. Your shop is absolutely full of altars. I guess that only makes sense. Please take your time today looking at our selection of altars―and if you see one or two you like, please let me know! In addition to the black altars you often see, you have carved altars showing the wood grain, like works of art, and fancy altars that look like vanities or ornamental shelves. There are so many varieties. These days altars fashioned to look like cabinets are selling well. An altar made from Yakushima cedar. 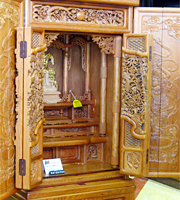 The skill of the artisans really stands out in several places, such as the relief of the doors. 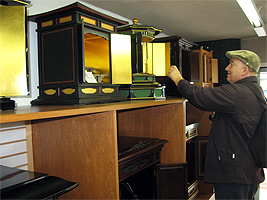 Tokyo-style altars built to look like cabinets are often made from nice woods such as ebony, rosewood, or mulberry, and come in many different shapes and colors. They also have many modern-looking ones that don’t look like altars at all until you open the doors. As I take a close look at each of these altars, I find myself fascinated by their beauty. Usually when we face a family altar, we are thinking about those who have passed away, and the time spent looking closely at the altar itself is short. Nevertheless, the skill of Japan’s artisans has gone into making them. Are they all made by hand? Yes. Each altar requires several steps done by skilled artisans, including the carving, lacquering, and adding of the gold leaf. At a workshop in Saitama our company employs 17 carpenters who specialize in temple architecture and construction, and in addition to family altars, they make adorning features of temples as well. Our artisans have also worked on Zojoji in Shiba, Tokyo, and Naritasan Shinshoji Temple, so the next time you visit, please take a close look. By adorning features, do you mean the shiny metallic decorations hanging from the top? That’s right, but those aren’t metal. As I was saying, the wood is carved into the right shape, lacquer is painted on, the pieces with gold leaf are made, and everything is put together. Construction of both temples and altar articles is done without using a single metal nail. Why don’t you use metal nails? I would think it would be stronger that way. Not at all―wood is actually much stronger. Nara and Kyoto have many wooden buildings built hundreds of years ago, right? On the surface, wood seems less strong, but actually, the opposite is true. By carving the pieces and using gold leaf, their brilliance lasts much longer than if the pieces were metal. Is that right? I have to wonder why is it that people build magnificent, lavishly decorated temples, be it Japanese temples or Western churches. I think it’s because in the old days, when Buddhism was just beginning to spread in Japan, people were greatly impressed by the size of the buildings and the splendor of the sparkling gold. They felt in awe―they felt the need to prostrate themselves before such majesty. This feeling led to religious belief. Separate from a belief in gods and the Buddha, ancestor worship has been an integral part of Buddhism in Japan from the beginning. It’s not “there was God and here I am,” but rather “there are my ancestors and here I am.” The family altar is the closest way for people to show their devotion. The concept of ancestor worship doesn’t exist in Christianity, which is why Christians don’t have family altars in their homes. Right. But things have changed in Japan. Most high-rise apartment buildings don’t have Japanese-style tatami rooms, and even single-family homes often don’t have a tokonoma. People’s relationships with temples have also diminished. In the Edo Period, Buddhist monks would name a child when she or he was born, and they dealt with matters of birth and death, and kept the official family registries. They played a leading role in people’s lives. These days however I think those kinds of things have become much less common. But I hear that recently the number of people visiting temples and shrines to find peace and tranquility has been growing. Japanese views on religion may change yet again. More and more people are leaving instructions for their funeral or the distribution of their property before they leave, have you heard? Yes, that’s become quite popular, hasn’t it? If you look at these instructions, you can see that some people want a simple funeral attended only by their relatives, and many families follow their instructions exactly. However, those kinds of instructions are written out of modesty; they don’t want to cause their families any more trouble than necessary. But people who have lived for 60, 70, or 80 years have met all kinds of people, made lots of friends, struggled together with many of them, and found happiness. They’ve lived a splendid life. To hold a funeral without telling the friends seems really sad. I think to the extent possible, funerals should be a time when lots of people gather to remember the deceased and their achievements, and give them a farewell. I think you’re absolutely right. We really learned a lot today from you. Thank you so much for talking with us.